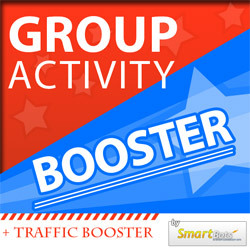 We’ve just released a new device – Group Activity BOOSTER to increase activity in your group and also boost the traffic of your parcel! GAB Machine regularly sends a special message to the group. This special message contains special “code” – 6-digit number. Group members see this code and teleport to your parcel. They touch the GAB Machine and enter the “code”. The first avatars teleported (the number is being specified by you) get paid a certain amount of money (also specified by you) after staying in the parcel for required time. GAB Machine boosts both you group members awareness and land traffic: group members know that your group messages (chat and/or notices) contain money-making and free-lindens messages. They are waiting for them. Residents also stay in your parcel awaiting for new code to arrive, or awaiting for payment. You can pay only the first resident teleported, or 5 visitors who come first – it is on your own. Visit SL Marketplace page for screenshots. The complete illustrated documentation is available is SmartBots docs: click here.